A new toy arrived today – the VisTablet, which is just a rebadged Aiptek 600U (model number WCK-C121). They sell as Aiptek or Waltop or Medion or any one of a few other names for about €65 on ebay.ie at the moment, so I thought what the heck, I do a fair bit of stuff in Gimp so maybe it’s worth a look. A few clicks and a week or so later and it arrives. Cue tearing open the box and unwrapping! Plugging it into the laptop (Thinkpad R61 running Debian Squeeze amd64) got an instant result in that it found the device and allowed cursor movement… but no actual buttons or pressure sensor stuff, so it couldn’t work as a tablet. So off to google we go and after trying some frustrating messing about with udev rules (to create /dev/apitektablet – which isn’t necessary it turns out) and hal fdi files (to set up X.org options, which are needed) and I’d advanced in a posterior direction. By now we were through the phase where plugging in the device crashed X and had reached the phase where plugging the device out crashed X. At this point, I found that the problem lay in the wacom drivers. See, just because it’s aiptek hardware doesn’t mean the aiptek drivers actually work – in this case, the wacom driver works much better. 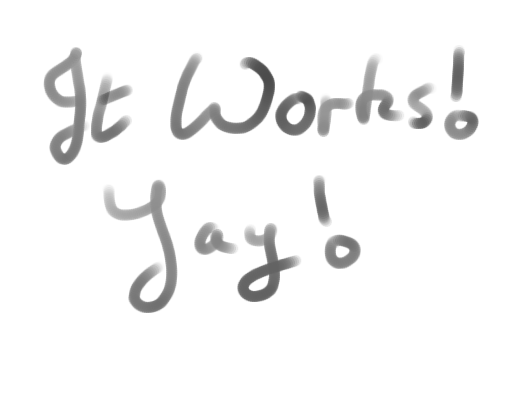 But, just to be annoying, the new version of the wacom driver doesn’t work because it picks up that it’s not a wacom device and commits seppku to avoid being of any use. Note to the coder who thought that was a good idea – go choke on a hairball please. Now apt-get install xorg-dev and whatever other packages you need like build-essential and call configure and make and then sudo make install. into the <device> section of the xml file (you probably don’t need the eraser and cursor lines, but what the heck, they don’t harm anything and I was too tired of restarting X at this point to check). You should now be almost done – restart hal, restart x.org, and log back in and then plug in the tablet (check dmesg and /var/log/X.0.log so you’re sure it worked) and then fire up Gimp, go to Edit->Preferences->Input Devices->Configure Extended Input Devices and make sure the tablet is listed there and that it’s not set to disabled, then go to Edit->Preferences->Input Controllers and make sure that Linux Input is in the list of active controllers and is set to look at the tablet, and it should work. Mind you… if this is what it takes to make cheap hardware work on linux, Linux Hater has a very good point. Next Post: What platform to write mobile apps for? 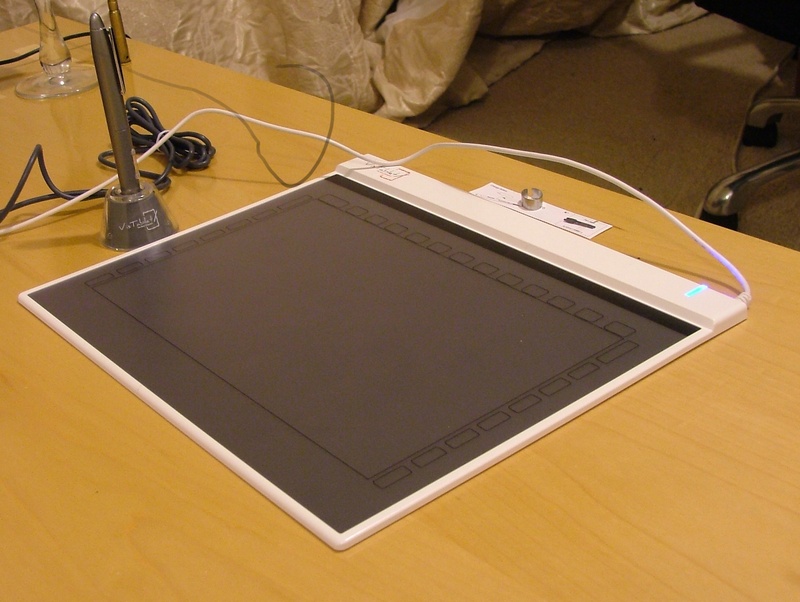 I too have one of these tablets, and was wondering if/how you got the buttons on the pen to work, and if/how you got the buttons around the side of the pad to work. The pen buttons seem to work and be mapped to the mouse buttons, but I can’t figure out how to map them to other functions in eg The Gimp. I can’t get the buttons around the outside of the pad to do anything. Thanks for your blog. I’ve recently come across a VisTablet PenPad. Using a patch similar to yours I get pressure sensitivity in inkscape and gimp. I’ve even submitted a patch to the linuxwacom folks, so hopefully that gets committed upstream. I’ve got some questions for you. Both of my buttons send the same button event (though this is not the case in MacOS). Do you see this? Also how does the eraser function? I’m not sure that mine has an eraser, but I’m curious. * Copyright 2002-2010 by Ping Cheng, Wacom Technology. Thanks, After weeks of trying, your post helped the most. Still tweaking the buttons & calibration, but everything is working well (mainly pressure in Gimp, MyPaint, Blender, etc. ).